Into its second year of operations, Russia’s Azimuth Airlines, a private Rostov-based regional carrier with government backing and a fleet consisting entirely of Russian-built Sukhoi Superjet 100 regional jets, is quite satisfied with craftsmanship of Russia’s aircraft industry, launched international services, and not believe that Aeroflot’s plans for increasing its regional presence poses a threat. An explanation for what is stimulating Azimuth’s optimism is something Russian Aviation Insider’s sister publication ATO.ru tried to unearth during a visit to Rostov-on-Don in September. The creation of Azimuth Airlines was considered to have been singularly opportunistic, launching as it did ‘at the right place, at the right time,’ with its emergence coinciding with attractive government incentives for SSJ100 operators. Also, at the time, the entire south of Russia had been underserved following the demise of Grozny Avia, its last local operator. Moreover, the brand new Rostov-on-Don Airport that serves the industrial centre of the region, was left without a base carrier after Donavia merged with St Petersburg-based Rossiya Airlines under the Aeroflot group. 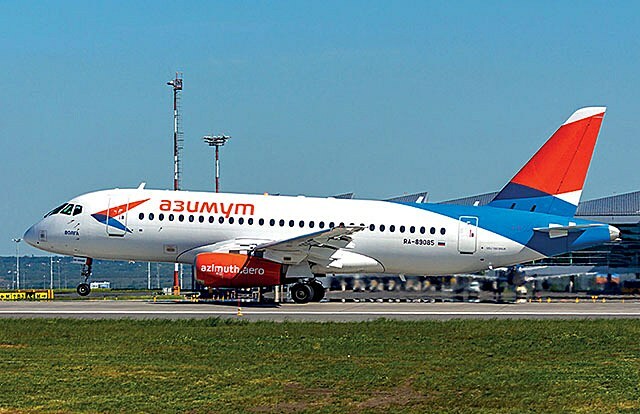 Azimuth Airlines (IATA code: A4) launched commercial operations of its Russian-built Superjet 100s in September 2017, operating them from the old Rostov-on-Don airport (IATA: RVI) before, several months later, moving to the city’s newly built Platov Airport (IATA: ROV). It currently bases five of its eight-strong fleet at Platov, which is now the departure point for the majority of its route network. The remaining three aircraft fly from Krasnodar’s Pashkovsky Airport (IATA: KRR). All of its eight aircraft were delivered under a contract agreement with State Transport Leasing Corporation (GTLK), Russia’s largest leasing company. Compared to other SSJ100 operators, some of whom have been critical of aspects of the aircraft’s aftersales support, Azimuth is instead enjoying a relatively smooth ride with the type. The airline’s flight regularity has not suffered from downtime delays, partly because its schedule of operations is organised around six aircraft, with two always on stand-by, one each at Rostov and Krasnodar. The seventh aircraft may occasionally be engaged for a charter flight, but that does not occur frequently. 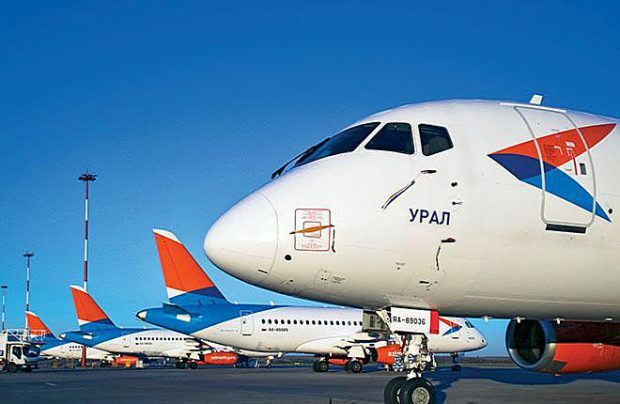 At the same time, to keep its fleet in good shape, the airline holds a stock of spare parts at Rostov’s Platov Airport, thereby benefiting from one aspect of the government’s incentives programme. The operator has thus far received spares for the first four SSJ100s, with each set worth 115 million roubles (US$1.8 million). Azimuth has paid only 10 per cent of the costs, with the remaining money allocated to SCAC, the aircraft’s manufacturer, directly from the federal budget. Spares for the remaining four jets, which joined the fleet earlier this year, continue to be delivered. As part of the SSJ100 warranty scheme, which applies to each aircraft for two years after delivery, a SCAC field representative is available, on duty, at Rostov. But even when the warranty period expires, Azimuth plans to stay in close touch with Sukhoi Civil by joining a components pool agreement. The airline insists it has already established “a good working relationship” with both the aircraft manufacturer and the engine producer. “Our philosophy is 100 per cent dispatch reliability. We are in direct contact with Darya Dorenvendt, senior vice-president for aftersales support, and chief designer Andrey Nedosekin, not to mention the mid-level SCAC management [team]. If an aircraft is grounded, we apply maximum effort to bring it back into service. We never keep it parked next to a fence,” stresses Azimuth Airlines’ technical director Anatoly Dolgov. A major part of Azimuth’s workforce has come from the defunct local carriers Don Airlines and Donavia (previously Aeroflot subsidiary Aeroflot-Don). “I used to deal with the Tu-154 and the Tu-134 as well as Boeings and Airbuses. I can tell you that, in terms of aftersales support, the SSJ100 has come a long way compared to the Tu-154. I can easily remember our constant struggle with the [Tupolev] design bureau over extending [the aircraft] lifetimes,” Dolgov recalls. Azimuth well knows that as long as its SSJ100s remain on the ground, then the prospect of any profits will soon evaporate. That recognition probably explains why, in one year, the airline’s Russian fleet has accumulated nearly 16,000 flight hours. Its oldest unit, registered as RA-89036, which was built in 2014, has already logged some 3,000 flight-hours. It is this aircraft that underwent its C-check (the first heavy maintenance requirement for the operator) fulfilled by Russian MRO specialist S7 Technics. This is another key element that has clearly assisted the Rostov airline in establishing a positive relationship with the type. Furthermore, last November Azimuth won its own FAP-285 approval from the Russian authorities and today its engineering department employs some 70 people, including 10 at Krasnodar, and performs all maintenance work in-house. Azimuth believes that relying on its own capabilities is more cost-efficient than outsourcing maintenance tasks. Consequently it has scheduled its own first C-check for 2019, at a fast-assembling hangar, which is yet to be built at Platov Airport. Azimuth is fully aware of the issues and problems that other SSJ100 operators have been experiencing with the type, and attributes its own successful operation to persistence and having no illusions. “There’s always something to improve, nothing is ever ideal. My biggest concern is the cost of spare parts. It is very high,” the airline’s general director Pavel Ekzhanov reveals to ATO.ru. This is particularly true for engine components. Meanwhile, the airline welcomes the planned increase of Russian-built components in Superjet, is also keeping an eye on the winglet option, and is expecting the engine exchange offer to appear before the end of this year. “Those pilots who have experience of flying the first serial production SSJ100s note that the aircraft are [steadily] improving. When you combine a serious [business-like] attitude with typical southern cordiality, then everything can be worked out. As yet there have not been any real deadlocks with the SSJ100. I’m sure it’ll continue that way,” assures Eduard Teplitsky, Azimuth’s executive director. Azimuth’s headquarters is located in the same building as the Regional Development Corporation (RDC), which has been the owner of a 25 per cent, plus two shares package of the airline since the spring of 2018. 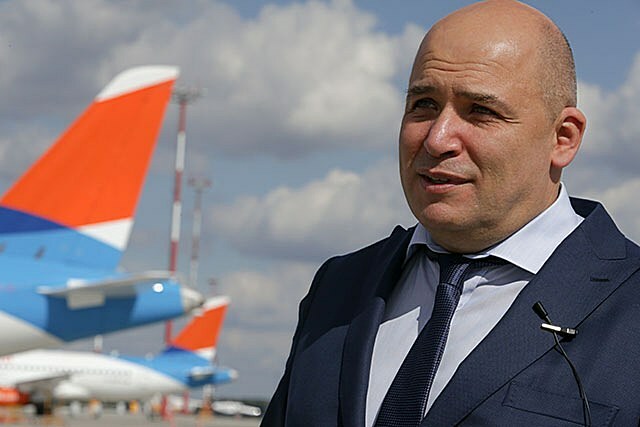 Now RDC’s general director Alexander Zhukov is on the airline’s board of directors, along with Vitaly Vantsev, who is co-owner of Moscow’s Vnukovo Airport; Pavel Udod, who previously held an executive position at Yakutiya Airlines; and others. Eduard Teplitsky notes that this structure is balanced and stable, and the creation of Azimuth is all about business. He adds that the Rostov region’s administrative body also plays an important role in the airline, even though there are no direct subsidies from the regional budget. Last year Azimuth posted almost 165 million roubles (US$2.5 million) of losses. “This couldn’t have been [any] different. We took the hardest route by deciding to obtain an AOC from scratch. We hired personnel and paid wages, we leased aircraft and continued to meticulously pay the leasing fees even when the aircraft were not flying. The preparation took about half a year, during which we did not generate any revenue. So there was no way we could see any profits in 2017,” Teplitsky comments. The airline is still in the investment phase and is not planning to climb into the black in 2018. Instead, the break-even point is set for the end of next year. Targets include increasing the average daily utilization for the SSJ100 fleet to nine or 10 hours per day. One of the ways of achieving this is by reducing turn-around times. There are other methods too, such as implementing an optimised fuel strategy that includes tanking, and by introducing a new revenue management system. Although Platov Airport is closely interested in the development of its base airline, there are no exclusive preferences. The airline enjoys the same standard discounts as other carriers under the airport’s incentive programme for attracting new routes. Rostov’s airport is currently responsible for about 60 per cent of the airline’s traffic, and that figure is likely to remain, even though the airline is targeting to raise its market share at its base airport to 15 per cent next year. According to Teplitsky, the airline is currently offering some 50 routes, of which one fifth are supported by the federal budget’s regional air service incentive programme. “We do take advantage of it, but it’s not our primary source of income,” he admits. 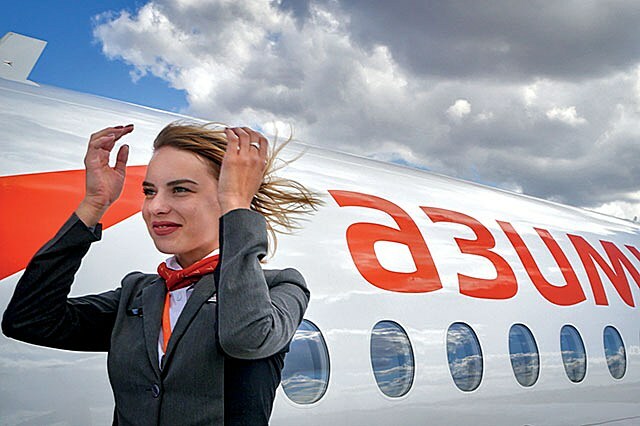 From Rostov, in early October of this year, Azimuth launched its first flights outside Russia to the two CIS capitals of Yerevan (Armenia) and Bishkek (Kyrgyzstan). In 2019, two years after its launch (in compliance with the Russian regulations) the airline intends to start flying truly internationally from Rostov and Krasnodar to destinations in Germany, Israel and Turkey, Teplitsky points out. Another interesting market – and one that lies beyond its home region – is St Petersburg. In the first eight months of 2018, Azimuth Airlines served some 385,000 passengers and the year total is expected to exceed 700,000. The average flight sector is about two hours, or nearly 1,600 km. The airline’s main inter-regional travel product has been well received by the market judging by the seat load factor that, in the said period, averaged 83.9 per cent, just 0.4 percentage points short of the industry average. “We are a southern airline, so the major part of our route network links points in the southern and northern Caucasus area. The population has a demand for direct flights avoiding Moscow, and we are keeping up with that demand. Our flights to Siberia are also popular, because there is some commuter traffic. We also bear holidaymakers in mind by making their travel to holiday destinations more direct. For our network, the SSJ100 aircraft are quite efficient,” says Teplitsky. Through-fares are available across the entire route network, so passengers may use Platov as a hub for onward connection flights. So far, the share of Azimuth’s transit passengers has not exceeded five or six per cent. “It is not our primary task to increase that share. But we are observing certain interest for Rostov-on-Don as a hub,” Teplitsky comments. Perhaps Platov’s role as a regional hub would increase if Azimuth reached an interline or code-share agreement with Utair, one of Russia’s major airlines. At present, the start-up carrier ranks at 21st in the list of Russian airlines by passenger numbers. But its fleet is projected to grow, adding two more aircraft this coming spring and a further two in 2020, delivered through its sole lessor, GTLK. If the option for four additional SSJ100s, signed during the MAKS 2017 Airshow, materialises, then Azimuth should have 16 Superjets in its fleet by 2021. Eduard Teplitsky emphasises that Azimuth is not fighting for market share, but instead recognises that fleet expansion should help the airline increase its traffic to 1.2 million passengers by the end of 2019, thus improving its ranking. Right now the Rostov-based airline remains at the rollout stage and is focused mostly on refining its product. Although the airline is constantly monitoring the foreign aircraft market, the prospect of bigger-sized aircraft is not on the agenda, until 2019 at least. The preference would be a stretched version of the Sukhoi Superjet 100 if the manufacturer decided to proceed with that programme. Azimuth meanwhile, does not believe that Aeroflot’s plans for increasing its regional presence with the proposed addition of as many as 100 SSJ100s, poses a threat to the Rostov operations. In fact, Aeroflot has not mentioned either Rostov-on-Don or Krasnodar as potential candidates for its new regional bases.